In the final days leading up to the big day for my wife and I, lots of last minute, late night trips to various retail outlets were required. 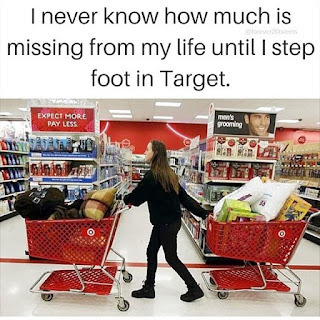 For instance, we'd run to Hobby Lobby to find extra materials for the bridesmaid bouquets, cruise over to Target for some odds n' ends decorations, trek to Sam's Club to print out our program poster, and mosey down to Walmart for poster-board and spray glue. In short, there was always something we needed that we hadn't considered. I never complained because A) I value my life and B) this always afforded me an opportunity to stealing a browsing session in the card aisle. 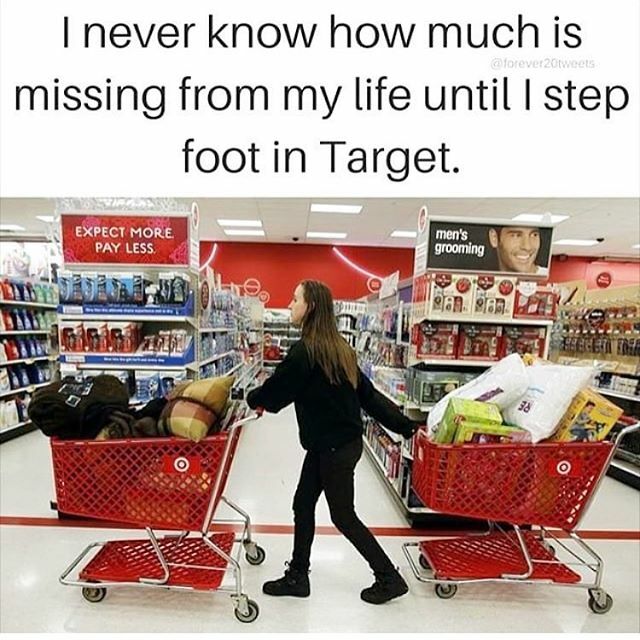 It's the small things in life. During our adventure to acquire spray glue and poster-board from the evil big box empire, known colloquially as Wally World, my then wife-to-bed abstained from going inside, as the tight quarters, bizarre people and demolition derby parking lots do nothing inflame rage inside of her chest. So, I was left alone, to my own devices and I couldn't help but pick a little something up for myself while I was left unattended. 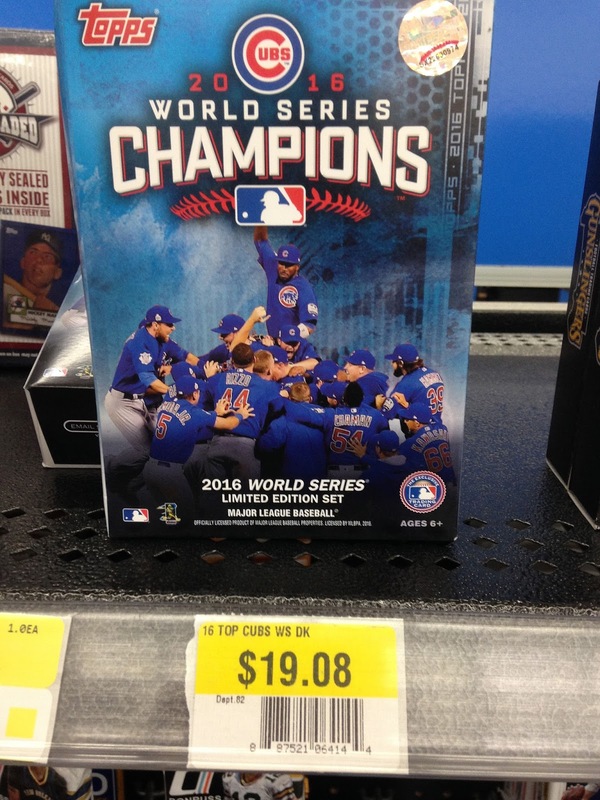 What you see here is a hanger-box version of the 2016 World Series Champion box set, for the appropriate price of $19.08. 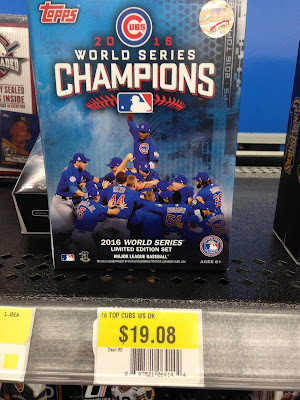 If you don't understand why that pricing was enough to make me want to snap a picture, then you weren't paying a lick of attention during the playoffs. 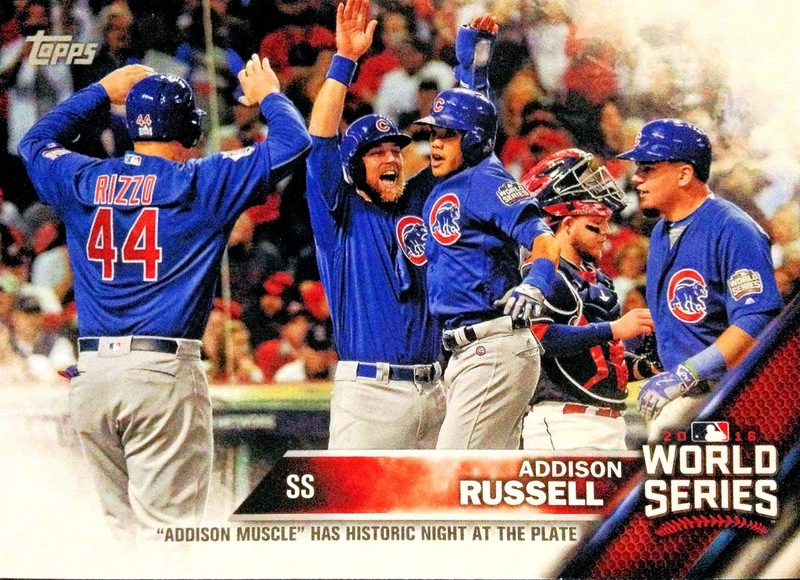 This abbreviated version of the set was a few dollars cheap than the blaster version and, as a Cubs diehard, I felt compelled to own at least one version of the set commemorating the historic and long-awaited triumph of the "Lovable Losers." With that in mind, I slipped the cards in with my foam board and Elmer's and went about my business. 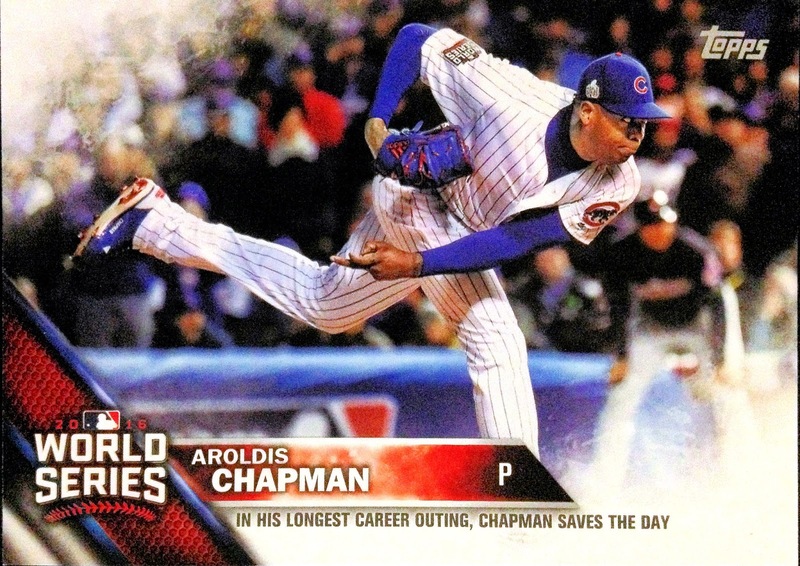 @RosterJenga Any guys that didn't appear as a Cub in traded set—I remember the Sox set in 04 had a handful of guys like that. 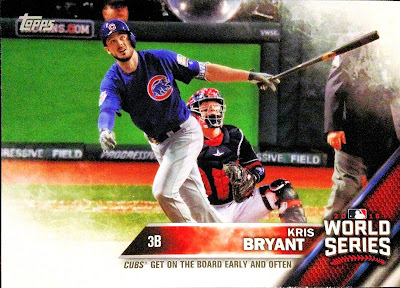 Only Sox card. Back at home, after putting together the program poster and opening the pack of cards, I couldn't help but feel a tad disappointed. First of all, I discovered that I misspelled the flower girl's name while designing the display piece. Second of all, I was hoping this World Series-centric set would focus on the players on the curse-busting roster. 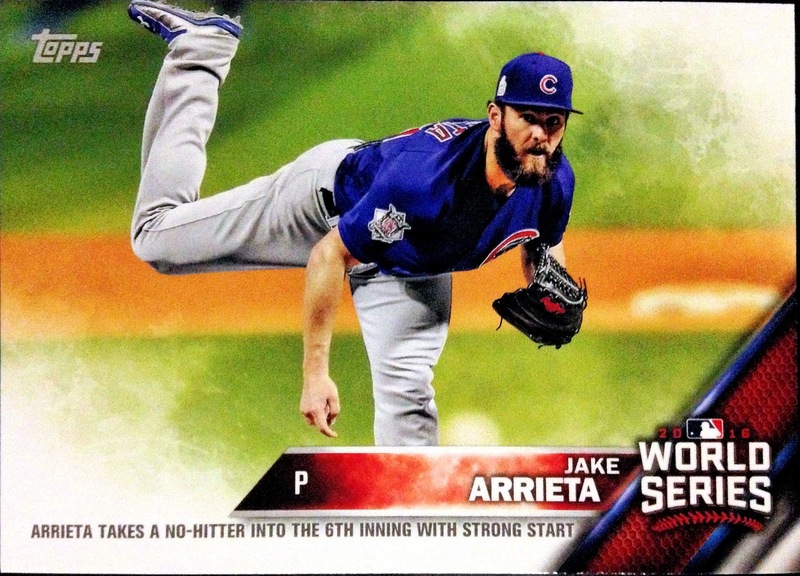 ... or Jake Arrieta's near no-hitter in Game Two. All of the cards focused on specific moments from the World Series. This isn't necessarily a bad thing; it just wasn't what I was hoping for from the collation. C'est la vie. 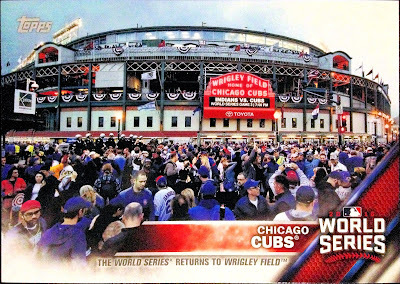 This might be my favorite card of "the Friendly Confines"ever issued - you can almost feel the playoff buzz, just holding it. How about Rizzo and Ross connecting for a highlight reel catch that was almost a nasty blooper in a "do or die" Game 5? Such a roller-coaster of emotion! The one other complaint that I have about this blister pack set is the focus on horizontal cards. I know I'm in the minority on the blogosphere, but I have an unfair bias against horizontally-aligned trading cards. I like my cards in standard size and vertical alignment - it must be some sort of OCD-like twitch. However, I know certain photos wouldn't work right, or do the action depicted justice, in that format. 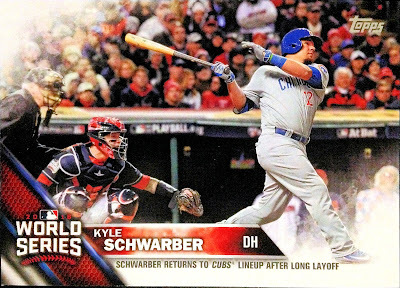 I just wish that almost all of the cards in this set weren't horizontal. The format works for this shot of Aroldis Chapman, putting everything into his patented fastball, with this commemoration of his longest career outing. It's much nicer than his base card, found in Update. 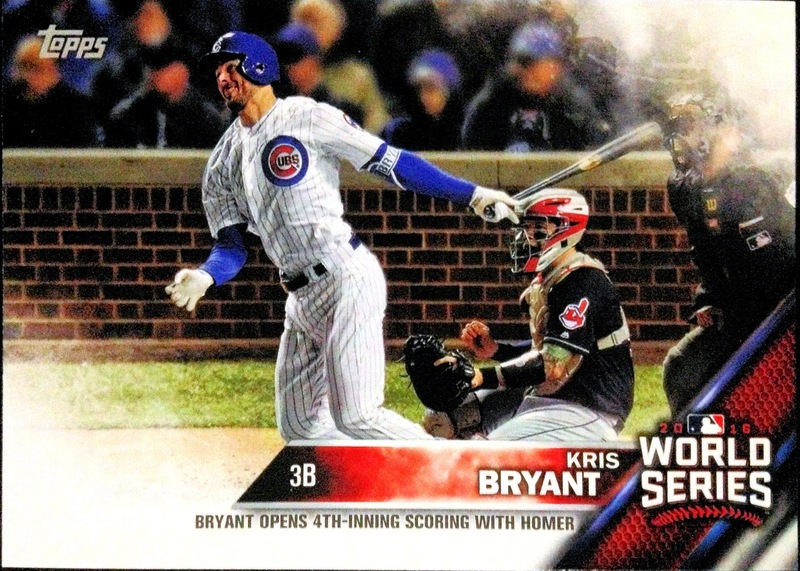 On the other hand, this card seems superfluous and like an excuse to add another Kris Bryant card into the product. 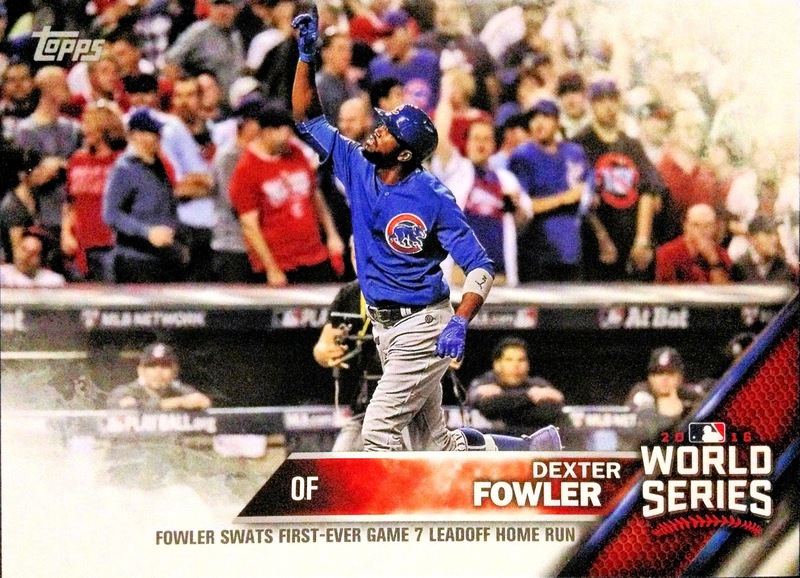 This one, documenting the most important grand salami in franchise history is definitely not superfluous. Look at the unbridled joy! 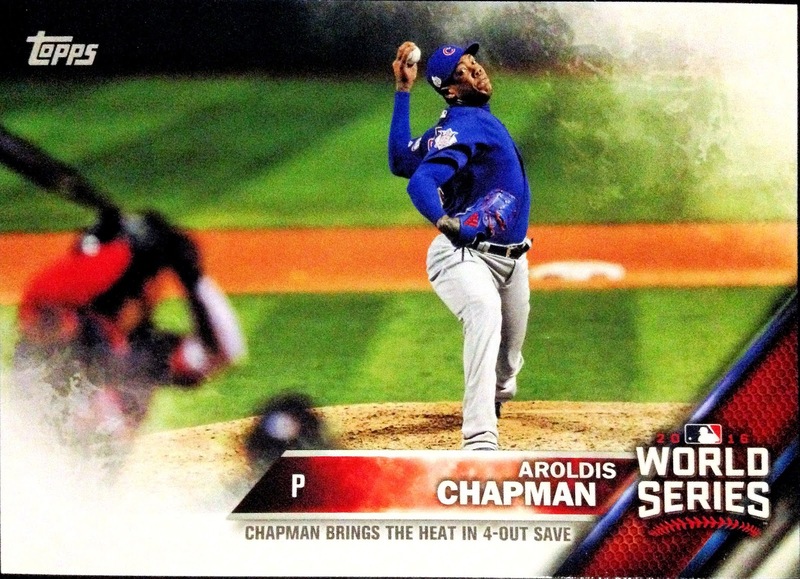 Another card talking about a Chapman save; however, the fire-baller only registered one save during World Series play. Hmmm... That's more confusing than Joe Maddon's handling (abusing) of the lefty. Ah, we're in Game Seven turf now. 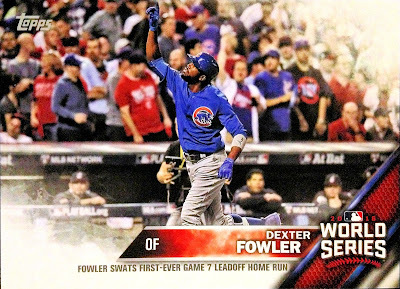 When Dexter Fowler lead off the crucial contest with a home run, we just knew that we were in for a treat of a game. 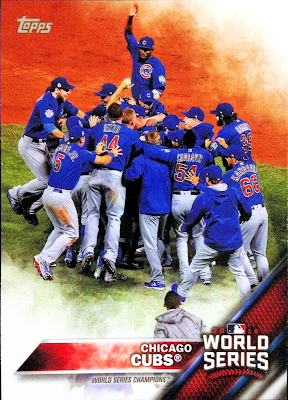 One of the three vertical cards in the entire set and it documents one of the most storybook moments of a storybook tilt. 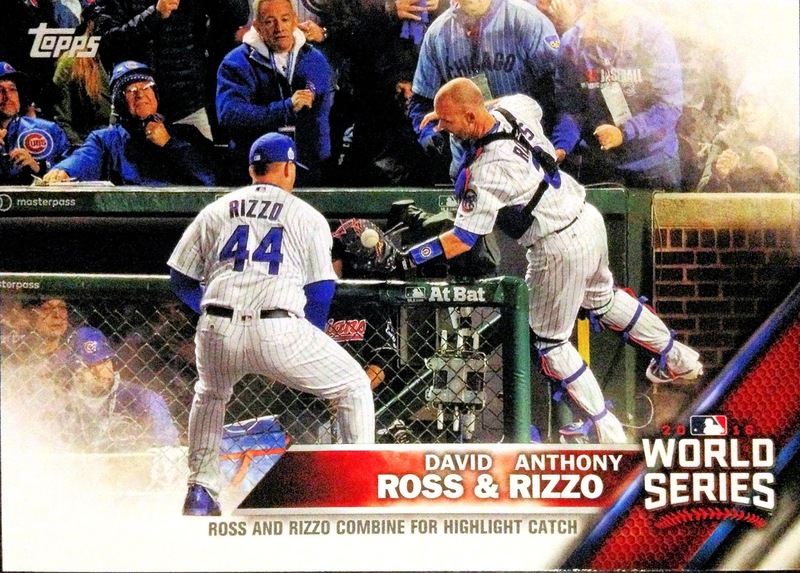 This memento of Ross swatting a homer in his final MLB appearance will slide into my CATRC binder as his representation - no contest. 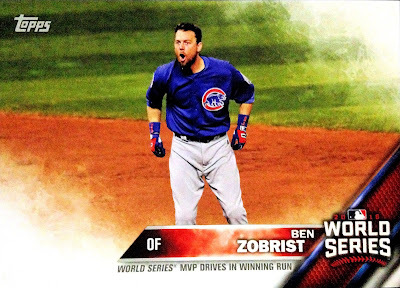 Here's another horizontal piece of ephemera, showcasing the pure exuberance of Ben Zobrist as he drove in the winning run. Although, it would have been much nicer if they'd caught him in the apex of his leap, at second base... and used a vertical layout. Too much blank space. Finally, we wrap it up with the best card of the bunch - one that would have won my "best cards of 2016" countdown, had I possessed it at the time. 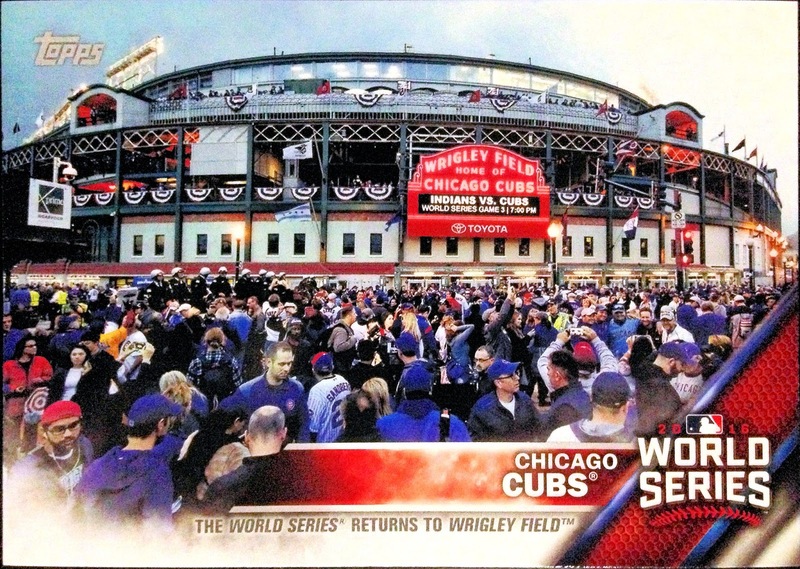 What Cubs fan's collection could be complete without a card celebrating the club's first World Series win in several generations? The answer is none. 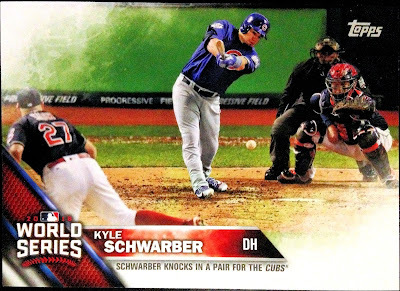 In short, while I was disappointed with the amount of horizontal cards and the fact that it was less player-centric and focused more on specific moments, it was still quite enjoyable to flip through this special World Series set. Although, this hanger-pack version is not complete - the blaster edition has several more cards contained within. Mine is but a sampling. 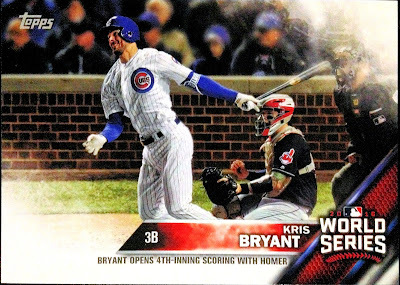 I agree I like all vertical cards - don't make a set with both. I agree completely on the preference of vertical cards only. That celebration card is a beauty. Liked your Freudian slip also..... my then wife-to-bed Perfect. I have the blaster and hanger, but have not opened the hanger, because I was assuming the cards were EXACTLY the same. After reading your post I can confirm that they are not. Three of the card fronts from cards 1 through 15 between the two are the same. The captions on the fronts, and everything on I'm the backs (I'm assuming), are identical. The other twelve have different photos. 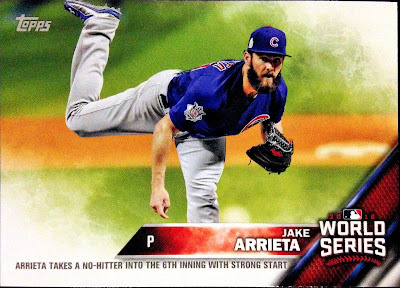 Oddly enough, all of the first fifteen highlight cards in the blaster are horizontal. 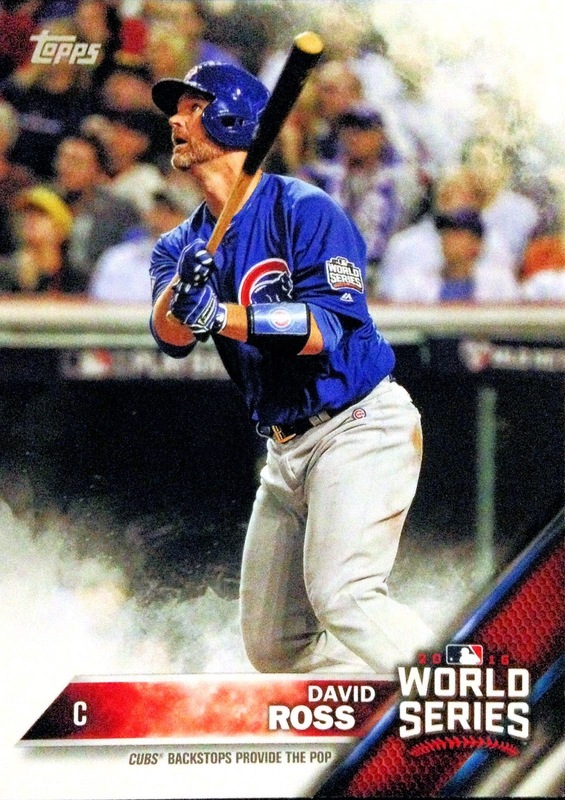 Every other card, 16-25 are of players and are all vertical. 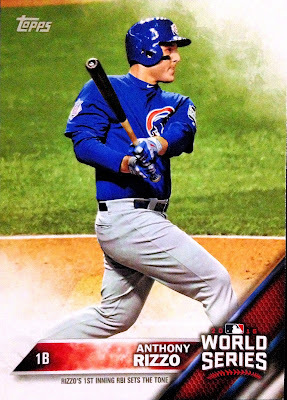 And to answer your question, there's no Mike Montgomerys or Rob Zs in the back half of the blaster checklist... only the guys you would expect... (Contreras, Lester, Russell, Bryant, Zobrist, Rizzo, Baez, Arrieta, Schwarber and Chapman) I'm a little shocked Hendricks didn't get a card. But, maybe that's just me. Why Not in Hall of Fame?